It has been a mystery as to what causes pectus excavatum and pectus carinatum. But here’s the best resource I have found, linking zinc deficiency to pectus. I also find it quite interesting that Vegetarians are at the highest risk of low zinc levels. This is because it’s mainly found in meats such as lamb, pork, crabmeat, turkey, chicken, lobster, clams and salmon. It’s also in nuts, seeds and dairy. Both of my parents have been vegetarians for over 30 years, and I may have been born with low levels of Zinc in the first place. This may be another reason why some of us develop pectus from a young age. I also had bad stretch marks during my teen years and overly mobile joints, which are both another symptom of low levels of zinc. I’m not blaming my parents, or parents in general who choose to be vegetarian, it’s just the way things are. If you read the book Nutrition and Physical Degeneration by Weston A. Price, he shows you how parents who were lacking certain nutrients from their diet had children with certain skeletal conditions, such as Club Foot and crowded teeth. Their teeth were also high in cavities (something I have also got). He doesn’t talk about pectus but it does make an interesting point. Highly recommended! As a metabolic typing advisor, I’m aware that some of us, due to genetics, should not be vegetarians. A certain few individuals on this planet can get away with being vegetarian, but only a very small percentage. But that is another story. If you do have pectus, do you or your parent/s follow a vegetarian diet, or used to? It would be interesting to know. Add your comments in the box below. 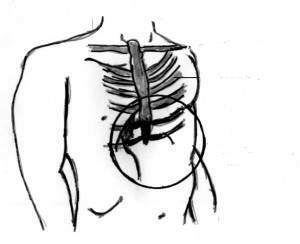 To round this point off, it still surprises me that even up to this point in time there has not been, to my knowledge, an exercise book or manual produced to improve pectus excavatum. Having this condition myself at a mild level, I have improved my chest to some degree with certain exercises. That is why I decided to put an e-book together, “Pectus Free without Surgery” (see link below), so I can share the exercises I have used over the last few years to improve my chest. As I say in the beginning of the book, the “pectus free” part of the title is not necessarily going to be true for everybody – it all depends on the original degree of an individual’s pectus. This e-book is merely a tool to help those with pectus improve their posture, breathing, body movement, strength, confidence and of course, the look of their chest and body. My chest wall is still not perfectly flat, and I still have a slight sideways curvature in my lower back. But both have improved significantly over the last couple of years and I am still working on it! It is a simple, to the point and practical e-book that is easy to read, as I wanted the e-book to cater to most age groups. The book consists of a little over eighty pages. I have tried to the put the e-book / exercises in a logical format, to make it as effective as possible. There are over thirty exercises to choose from, which are under four categories: postural, strength, ribcage and core. Even though the exercises are under four separate categories, nearly all the exercises have a positive (direct or indirect) impact on improving pectus excavatum. You can get the e-book here. P.S here are a few exercises straight from the book to help you now. ← Our online privacy is not very private at all! You should watch the Terms and Conditions May Apply documentary!